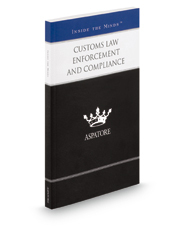 Customs Law Enforcement and Compliance provides an authoritative, insider's perspective on mitigating enforcement risks through up-to-date compliance strategies. Experienced partners from law firms across the nation guide the reader through the process of tailoring compliance programs to fit individual companies and identify recent trends in enforcement procedures. These top lawyers offer specific advice on encouraging strong recordkeeping practices to meet the requirements of the Modernization Act, ensure that compliance manuals reflect the needs of the importer, and outline compliance basics, including classification, valuation, and import origin. Covering a range of topics from avoiding enforcement triggers during the entry process to reducing noncompliance penalties through prior disclosure, these experts help clients assess and manage risks, and discuss key strategies for attaining a resolution for presumed violations. The different niches represented and the breadth of perspectives presented enable readers to get inside some of the great legal minds of today, as these experienced lawyers offer up their thoughts on the keys to success within this dynamic legal field.